The stems and vascular tissue of plants serve several vital functions. Stems provide support for leaves, helping to keep the leaves in light, as well as support for flowers and fruits. Stems also produce new living tissue allowing plants to grow and reproduce. The vascular tissue within stems forms the plant’s system for moving water, minerals, nutrients and the products of photosynthesis throughout the plant, much like the human vascular system. Lastly, stems can store nutrients and water for later use. A minor function of stems is to produce carbohydrates via photosynthesis. However, photosynthesis in stems is usually not significant compared to leaves. There are some exceptions; for example, in some plants, such as cacti, photosynthetic processes within stems account for most of the plant’s carbon fixation. Figure 7.12: Stem showing internode, nodes, a leaf, and a petiole. A stem is a collection of plant tissues that are joined together and arranged as nodes and internodes. 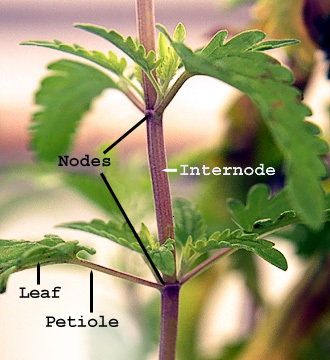 Nodes are locations where leaves attach to stems, and internodes are the leafless parts of stems that occur between nodes. New growth occurs at the nodes; nodes hold buds which grow into one or more leaves, inflorescences (flowers), cones or other stems. The internodes act as spaces that distance one node from another. Special note: Non-vascular plants have no roots, stems, or leaves, since each of these structures is defined as containing vascular tissue. The lobes (rounded parts) of the liverwort may look like leaves, but they are not true leaves because they have no xylem or phloem. Likewise, mosses and algae have no such tissues. The stem is one of the two main structural axes of the vascular plant. (The other main structural axis of plants are the roots.) In most plants, stems are located above the soil surface, but some plants have underground stems. Rhizomes, tubers and bulbs are all examples of underground stems. Figure 7.13: Plant tissue types. When we look at the structure of a stem, we can see the stem’s function reflected in it. The stem’s internal structure has both conducting and supporting tissues. While the tissues are basically the same in all of the plant’s parts, how the tissues are arranged in the stems (and the roots) are what differentiate the stem from other plant parts. Dermal tissue or the epidermis is a single layer of closely packed cells. It both covers and protects the plant. It can be considered as the plant’s “skin.” In plants that undergo secondary growth, the epidermis is replaced by periderm, also called bark. The periderm protects the plant from pathogens, prevents excessive water loss and provides insulation. Vascular tissue, which transports materials essential for plant survival between the roots and shoots, can be divided into two types: xylem and phloem. The xylem is the innermost ring of the vascular tissue. Xylem functions to transport water and minerals from the roots to the shoots. In contrast, the phloem surrounds the xylem and transfers food produced from leaves back down to the roots. The ground tissue which forms the bulk of the plant has many functions including photosynthesis, storage, and support. 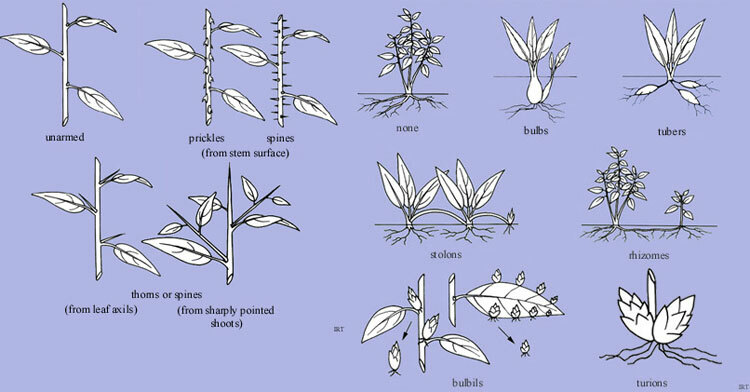 Figure 7.14: Examples of leaf arrangements on stems. The three most common types of leaf arrangement are: 1) alternate; 2) opposite; and 3) whorled. As the name implies, in plants displaying an alternate leaf arrangement, the leaves are arranged in a pattern alternating on either side of the stem. In this arrangement, just one leaf (can be a simple or compound leaf) is attached to one node. Plants displaying an opposite leaf arrangement have leaves growing opposite each other in pairs on the stem, so two leaves are attached to one node. In the third type, whorled leaf arrangement, three or more leaves are attached at each node on the stem. A whorl can occur as a basal structure. In this instance, all the leaves are attached at the base of the shoot and the internodes are small or absent. A basal whorl with a large number of leaves spread out in a circle is called a rosette. As already noted with other plant parts, evolution has led to several examples of modified stems that are used for special functions. Modified stems can grow above as well as below the ground. Modified stems located below the ground surface include bulbs, corms, rhizomes, and tubers. Modified stems located above ground include crowns, stolons, runners, tendrils, and spurs. For more information and pictures of modified stems, refer to this link from Backyardnature.net. Figure 7.15: Examples of different kinds of modified stems.